The Edmonton Oil Kings host the Calgary Hitmen for Game 5 of the 2013 Husky WHL Eastern Conference Championship series in WHL playoff action on Friday night. Great to see #2 @nippintwine back on the ice now for his first shift since Game 2 of this series #WelcomeBackCorbs! 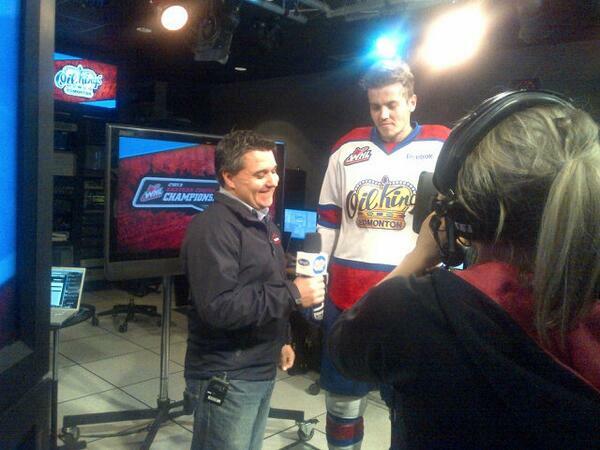 RT @EdmOilKings: Great to see #2 @nippintwine back on the ice now for his first shift since Game 2 of this series #WelcomeBackCorbs! 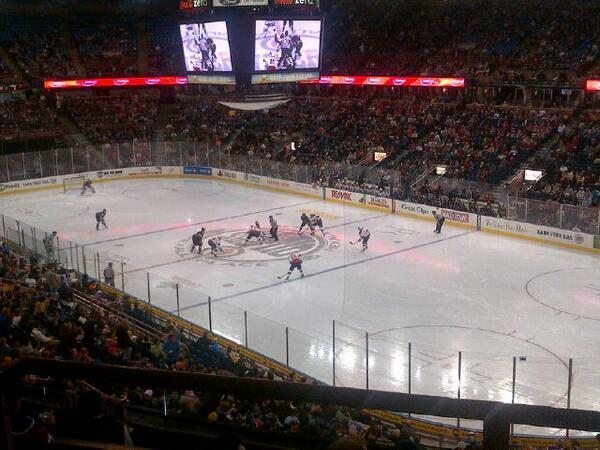 RT @TPS_Guy: @GlobalMillard @edmoilkings @whlhitmen Yes it's a very good crowd, won't be surprised if its over 11K. The Oil Kings open the scoring after Martin Gernat finishes off an Edmonton passing play. 1-0 Edmonton. WOO!! #Oilers @MartyGernat opens the scoring with a nifty backhand then takes a Slovakian Somersault courtesy Victor Rask... 1-0 #OilKings! RT @EdmontonOilers: Well said! RT @ahlekseu @EdmontonOilers? 6-0 @EdmOilKings? 3-0 @okcbarons? 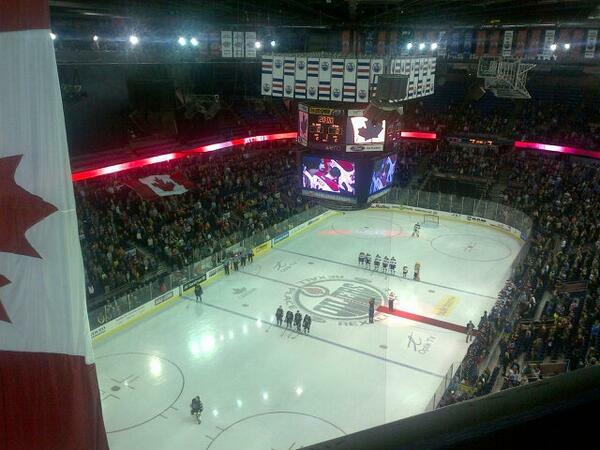 3-2 THIS IS OIL COUNTRY! The #WHLHitmen have hit the ice for the second period. Puck drop up next. Calgary starts the second down one man after a penalty gets called at the end of the first frame. St. Croix scores with six minutes left to give the Oil Kings a 4-0 lead with six minutes left. Hitmen on the powerplay with five minutes left. GOAL ~ Macek snipes a shot that appears to get tipped on the way past Brossoit on the powerplay. 4-1 Oil Kings with five minutes left. 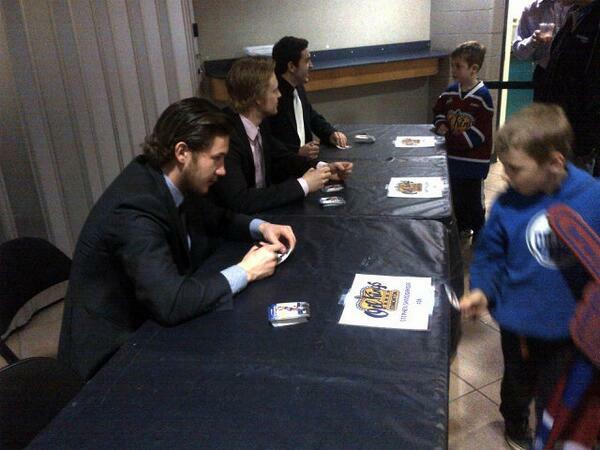 Lazar scores for the Oil Kings to make it 5-1 Edmonton. Edmonton #OilKings now just one win away from heading back to the #WHL Final. 5-1 win, take a 3-2 series lead over the #Hitmen. GM 6 Sunday. With exception to first 2 periods of game 3, the #OilKings have been the better team in this series. #Hitmen have to find another level Sun.